AT&T updated saying some cell sites may be affected, unsure how many customers. An attempted copper theft disrupted service to some customers early Tuesday officials said. 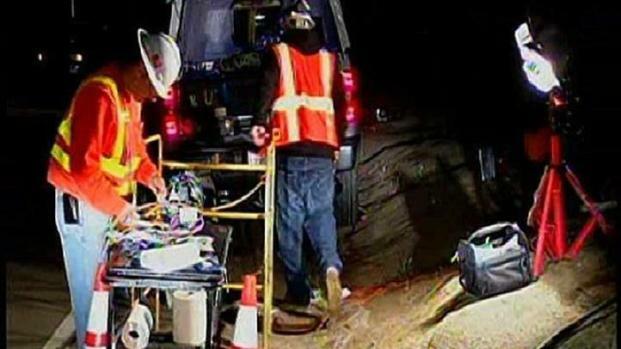 Someone cut a fiber optic cable between midnight and 1 a.m. on Alpine Boulevard in the rural community of Alpine east of San Diego. Seventy-five feet of fiber optic cable was taken along with 6 feet of 600 strand copper cable according to the San Diego County Sheriff’s Department. An estimated 10 million broadband lines were down according to deputies. Millions of broadband lines used by the Department of Defense, AT&T and Verizon were cut early Tuesday officials said. NBC 7's Megan Tevrizian reports. A crew of three men set up a small table along the two-lane road in Alpine near Puetz Valley Road where the line was compromised. They are working to repair a bundle of copper lines that were initially believed to serve MCAS Miramar and Navy Base San Diego 32nd Street according to deputies. However, later Tuesday morning Maj. Carl Redding sent an update via Twitter saying "MCAS Miramar is not affected by broadband lines theft in Alpine." Mylie Baca, spokesperson from Navy Base San Diego 32nd Street, told NBCSanDiego there was no interruption in data service. Deputies said the Alpine Sheriff’s Station and the Pine Valley Sheriff’s Station were affected by the interruption of the broadband lines however, the incident will not interrupt 911 service. Just after midnight a representative for Century Link Fibertron received notification the lines were down officials said. The fiber optic cable involved is considered the backbone of the company's nationwide network deputies said. A Centurylink spokesperson based on the East Coast told NBCSanDiego a man crawled into the manhole and cut into the network. She said the man tried to steal the copper cable and that this type of incident happens "in a lot of places." The spokesperson told NBCSanDiego thousands, not millions, of customers have been affected by the outage and that she expects the network to be restored by 1 p.m. PT. Three cables were involved in the incident according to an AT&T spokesperson. One cable was Centurylink's she said. While some AT&T cell sites were affected by the attempted copper theft, the spokesperson said, their crews are working to gauge how many customers were without service.